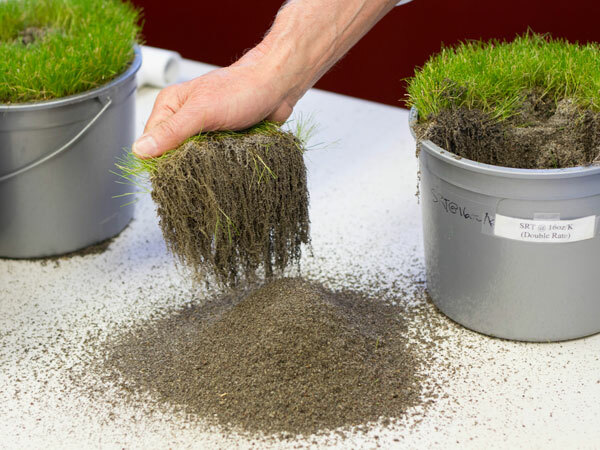 To compare the seed germination, root development and top growth between SuperRootsTurf (with endo-mycorrhizae) and 16-16-16, the industry standard at seeding. 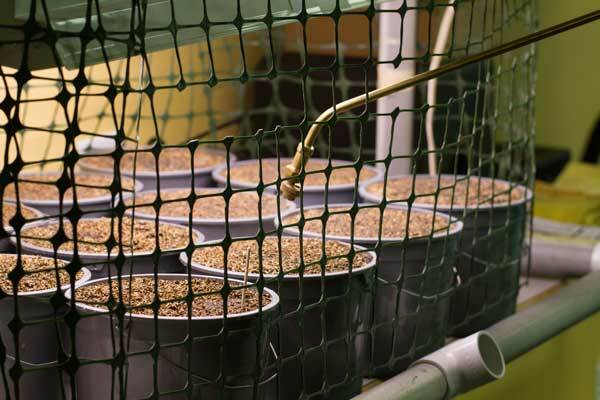 To mimic field conditions, all the test pots were stressed by extended over-watering and drought. 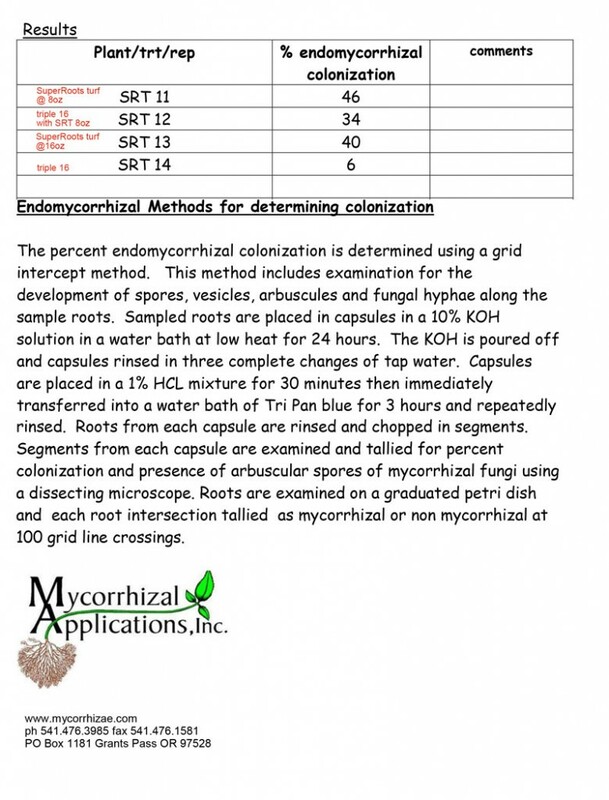 Test results from Mycorrhizal Applications Forest Grove, ORE. 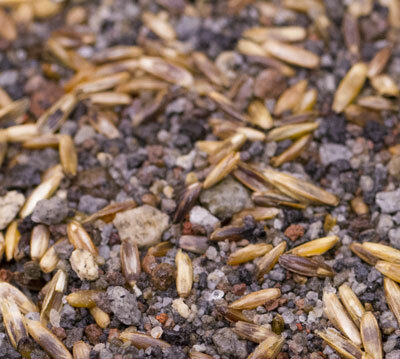 The trial began on 2-7-14 and ended on 4-11-14, the day these samples were harvested. 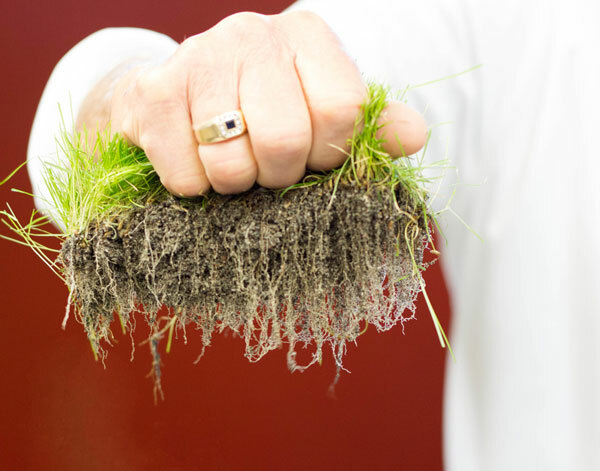 Soil – GCSA sand from T.E. Walrath. 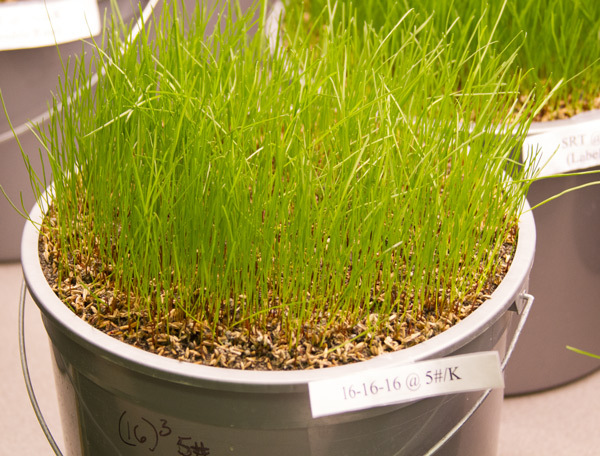 Perennial Ryegrass seed from County Green Turf Farm – sown at 10# 1000 / ft2 February 7, 2014. 16-16-16 and SuperRootsTurf, applied at seeding 2/7/14. 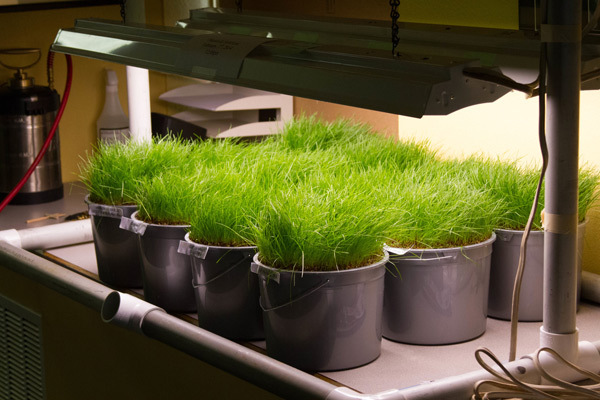 Grow lights on during normal daylight hours, off at night. Temperature at a constant 62 degrees. 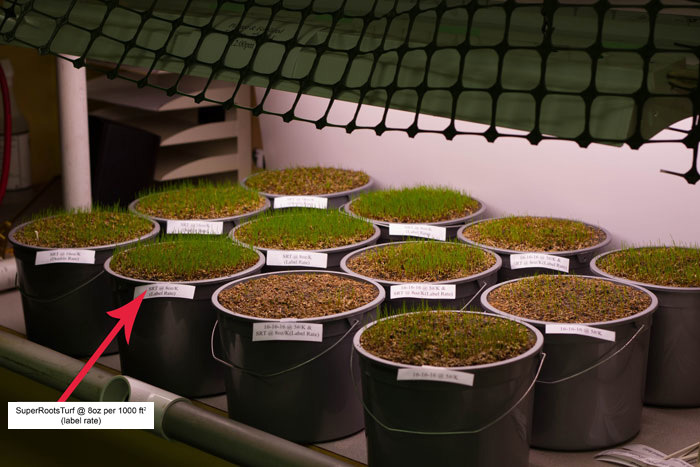 First visible blades 2/11, 3 days – 8 hours after seeding, on both SuperRootsTurf pots. 16-16-16 pots on 2/11, no visible blades. 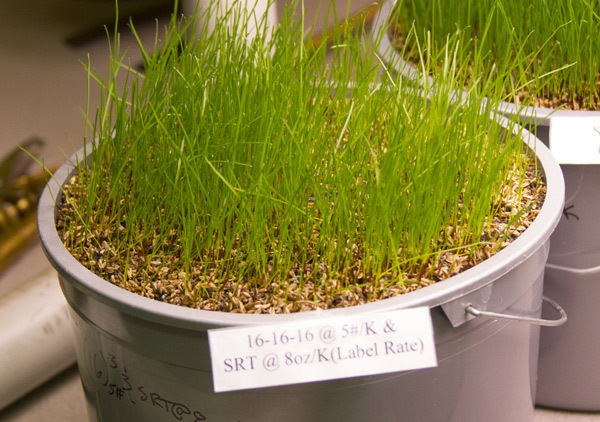 1st mowing 2/28 – Note deeper color, seedling density, and a 2/3 reduction in clipping yield for the SuperRootsTurf pots. 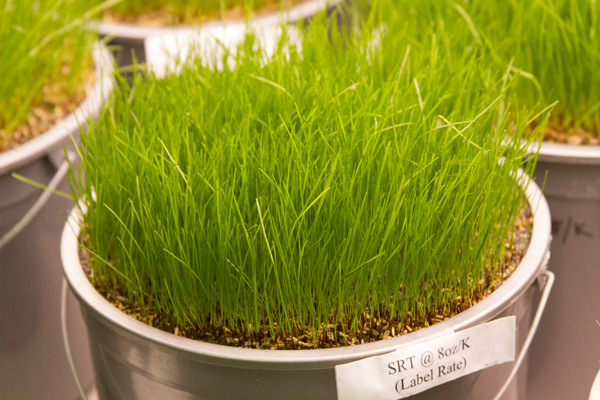 2nd cutting 3-10 The reduced clipping yield from the SuperRootsTurf pots was due to the lower nitrogen analysis of 5% and the reallocation of nutrients to root production, not top growth. 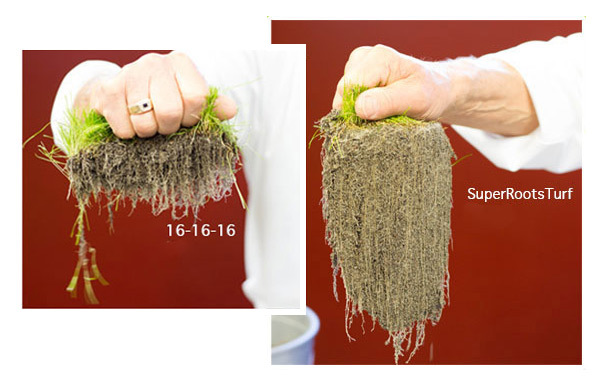 SuperRootsTurf sod shows the increased seed germination and extensive root growth that held the exact shape as it was pulled where the 16-16-16 pulled apart easily. 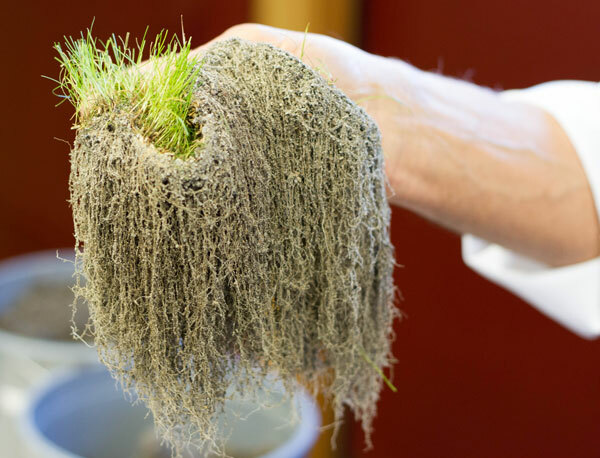 The low density and shorter roots was the result of the increased nutrients stimulating excessive top growth, not root expansion. This sample separated easily when pulled. 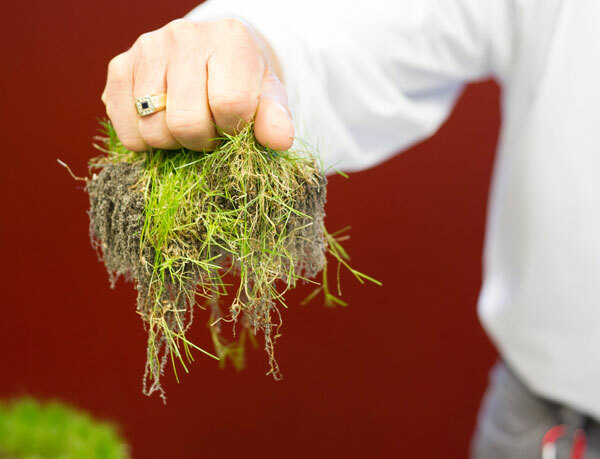 Even though the density of the root system planted with both products was greatly improved, it did not compare to the results of SuperRootsTurf alone. 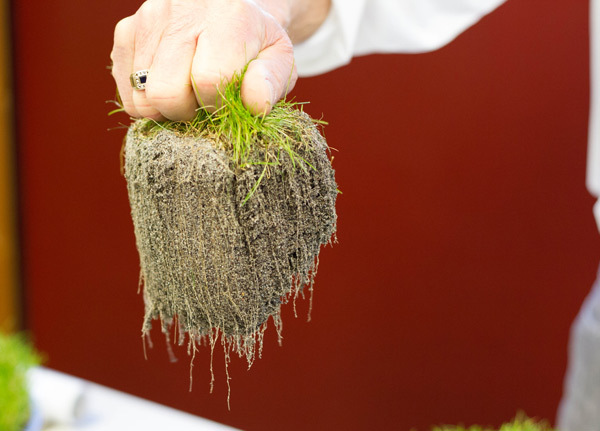 The increased density and length of the root system of this SuperRootsTurf, label rate sample was the result of the complex nutrient load and the symbiotic relationship between the roots and the endo-mycorrhizae in SuperRootsTurf. Note the lack of roots in the sand, they were “glued” together by the mycorrhizae and stayed intact when vigorously shaken. 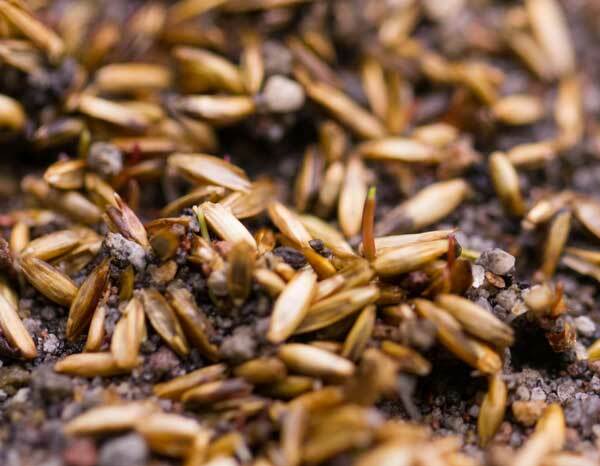 25% faster germination (3+ days for SuperRootsTurf, 4+ days for 16-16-16) with a significant increase in the number of germinated seeds. More than 50% increase in visible root mass. 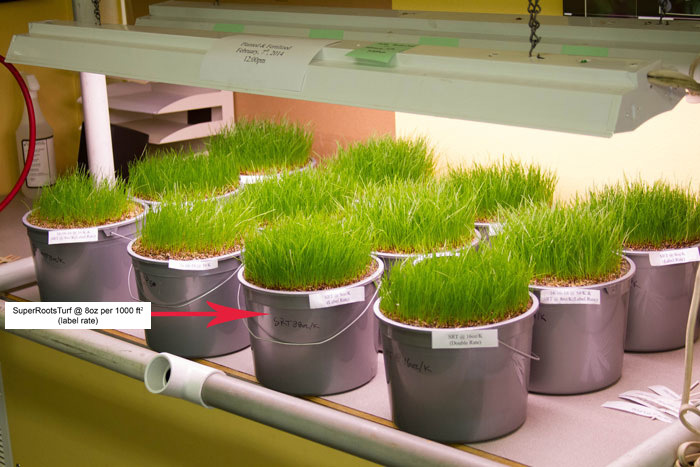 Increased chlorophyll production evidenced by deeper green blade color. 66% less clipping yield due to the reallocation of plant resources to root development, not top growth which would result in reduced initial mowing and damage would lead to reduced water requirement when field planted. 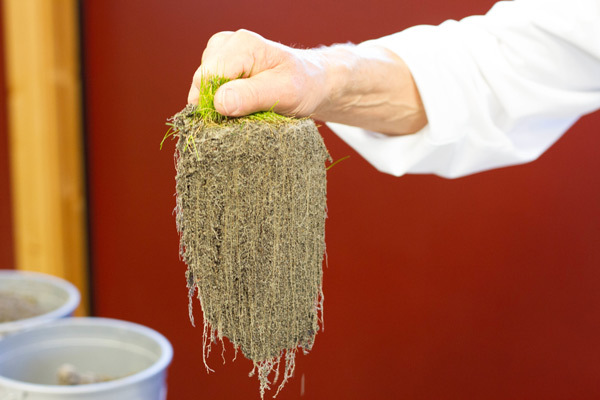 SuperRootsTurf contains no phosphorus however it “mined” the nutrient from the planting media (sand, in this case) due to the fulvic acids in the product breaking down the molecular size of the nutrient, hastening the uptake by the roots (osmosis). The test showed the addition of 16-16-16 reduced the root mass significantly and hindered the movement of micro-nutrients to the blade viewed by the diminished color in the pots with 16-16-16. 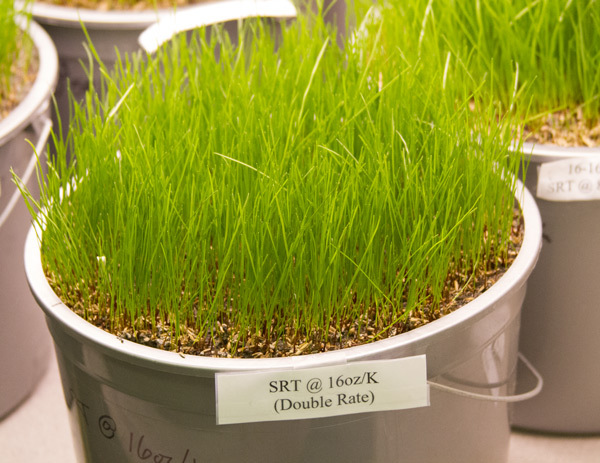 Plant Essentials is more than pleased with the results of these tests, and is confident SuperRootsTurf will perform equally as well in the field when applied at seeding as directed on the label. Applying more than the label rate (8 oz. 1000/ft2) will not increase performance.